The big green egg is the most versatile cooking tool I have ever owned. The ability to serve as a grill, smoker and oven makes it perfect for all of my cooking needs. After I got my big green egg, I had some friends over for a massive cookout to put it to the test. One couple loved it so much that they went out and bought their own the very next day. What I love the most is how many foods you can cook at the same time. The flavors don't blend together, and each food maintains its own distinct taste. The grill surface is perfect and so easy to clean. I enjoy smoking a ham on it because Green eggs and ham are just a good combo! All joking aside, the unique look at the fun flair to my patio. Performance Cooks food evenly and thoroughly with a huge surface area Versatility I love how much I can cook at one time. I can grill or smoke so many different meats and vegetables Ease of Use Whoever made this thing was obviously a grill master. Ease of Cleaning So easy to clean Durability I have good intentions of keeping mine under the patio cover but often leave it out and it has withstood the sun, wind and rain. Design Such a creative look that also serves as a conversation starter at cookouts. I love my Big Green Egg. The Egg is great for just about everything. It does a great job of both grilling and smoking. Smoked turkey, grilled steak, hot dogs, hamburgers, asparagus, zucchini. all have excellent flavor. Once lit, temperature can be adjusted by adjusting the ventilation slides. I especially love the fact that once you are done cooking, it closes up tightly so that the charcoal is extinguished and can be used in the future. The only negative to the egg is that it is difficult to clean the ashes out of because the interior has to be completely disassembled to get to the ashes, which must then be scooped out. I love this charcoal grill and the smoker is an extra bonus! First of all, the grill is large enough to cook for my family and it is excellent for family gathering's or other social events. The second great feature of this grill is the added versatility of the smoker. I love to cooked smoked fish and smoked meats in general and this grill does the job well. The grill is incredibly easy to use. I just load it up with charcoal, use some lighter fluid, light a match, and I'm ready to go! 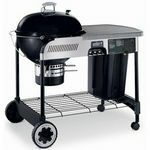 This grill does use up a lot of charcoal with each use, but this is because its larger than other charcoal grills. This grill gets hot fast. This grill is very sturdy, and I could not see anyone doing damage to it during use. I love the sleek design of the grill too. It looks great on the patio in the back yard! The only issue I have which is true with other charcoal grills is cleaning it up. Unfortunately this grill is a mess when your done, which prevented me from giving it a perfect ten. Highly recommend it! Versatility Love the smoker addition. Ease of Cleaning Horrible to clean. Your fingers will turn black. My husband purchased the Big Green Egg Charcoal Grill last year and we absolutely love it! The grill and smoker work just as they should and we have hosted many parties and entertained our family and friends with the Big Green Egg. The grill is the perfect size. 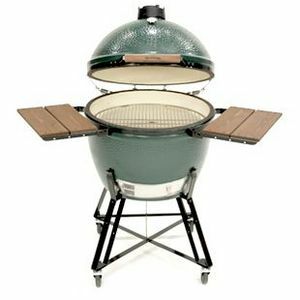 It's cooker itself is not too small, the Big Green Egg is just extremely well designed and it works perfectly for our family. It is not extremely large and it does not take over our entire patio. 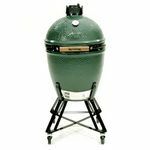 The Big Green Egg seems to contain heat nicely so it does not cause or screen enclosed patio to get too hot and smokey in the summertime either. The charcoal is relatively easy to clean and replace on the grill. All of it's functions are really to understand and use and I'd say it'd be a great grill for beginners! I love it and so does my husband. He calls himself the ultimate grill master when he's grilling on The Big Green Egg! The whole family loves it, and I would say it would be great for any family who wants a nice grill that is reliable but doesn't have a very large patio. 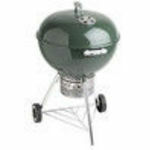 The big green egg smoker and grill are terrific. They are space savers especially if you only have a small patio or deck. I would recommend this grill for apartment dwellers or home owners that have limited space or even a big space. This grill is very versital. I was looking into buying some kind of new grill this summer when this beauty caught my eye. I didn't think that there would be so many features to it. I enjoy grilling but also like to smoke some of the meat I have as well. The biggest surprise was the ease of cleaning up after everything is cooked. It was smooth and in maybe ten minutes things were cleaned up and ready for the next Barbeque. It's a must have for any one who considers him/herself a grill-master. this product is a very easy to use grill. this grill gets the job done easy without hassle an brings out the flavor of the substance you are cooking.this grill haves your food tasting like a 5 star restaurant cooked it. Performance this grill performes like a gas stove it keeps going.this grill became my favorite grill to grill on the weekends its fast an easy. Versatility this grill you could steam or grill at the same time without having to get up every second to go check on your food Ease of Use its very light weight, easy to move place perfect in your back yard an out the reach of children Ease of Cleaning ease to clean,get a water hose an some soap to get this job done clean very good.just add water Durability this grill could last you as long as you want only in one condition. you would have to keep it in a good condition. Design this design is unique,especially the two flat bars on the side for placing your foor.the egg shape panel keep smoke inside for a better smoke flavor. Easiest to use charcoal grill ever! As a nice anniversary gift for my significant other, I decided to buy him this charcoal grill that would replace the old and dusty one he currently had. When he saw it, he was extremely excited and proceeded to give me lots of hugs and kisses. As it turns out, he had been eyeing this particular grill for quite some time because he loved the features, the size, and how convenient and easy it is to cook with. When we had our first barbecue with it, I saw why. The design of this grill is made so that grilling isn't a hassle. 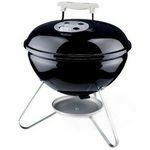 It has little flaps on the sides that allow you to put food, so there aren't constant trips to the kitchen, the grill gets hot easily after burning the charcoal for a few minutes, and it fits well in our relatively tiny backyard. We've also not only grilled with this appliance, but we've also smoked lots of our favorite foods with it. It makes meat and fishes taste especially great, and even vegetables are made a little better when cooked on it. Overall, I'm very glad that I bought this, as it has made his life a little happier and mine a little easier. Loved it so much we bought one for our son! My husband is in love with his egg, so much so that we purchased another one for our son for Christmas the year he moved into his home. The quality of the BBQ that is created on the egg cannot be surpassed by any other family member or friend using another model. Performance This is an excellent smoker, great for grilling, and my favorite pizza oven! The egg has served my family well. Oftentimes my son's friends call upon him to bring the BBQ to special functions and many have asked my husband to do the same. Versatility As I already stated, we love it as a smoker - but also use it to grill. My all time favorite use for it is to bake a pizza, as there is nothing better than a pie out of the pizza oven! Ease of Use Smoking is an art and the Egg is good for anyone who desires to own the best...but especially good for those serious smokers. They know who they are! Ease of Cleaning As with any outdoor grills or smokers, a bit of care after each use is all it takes to stay on top of things. Durability We have had to purchase replacement parts in the past, but my son has not. It may help that both of our Eggs are in tables that my husband built. These tables can be purchased, as well. Design We love the design which adds interest.